The College of New Jersey (TCNJ) is literally “in my backyard,” and is also one of the more popular options among the college-going population in the Garden State. TCNJ is a treasured public mid-sized (6,400 undergraduate) alternative to Rutgers-New Brunswick, the flagship state university. 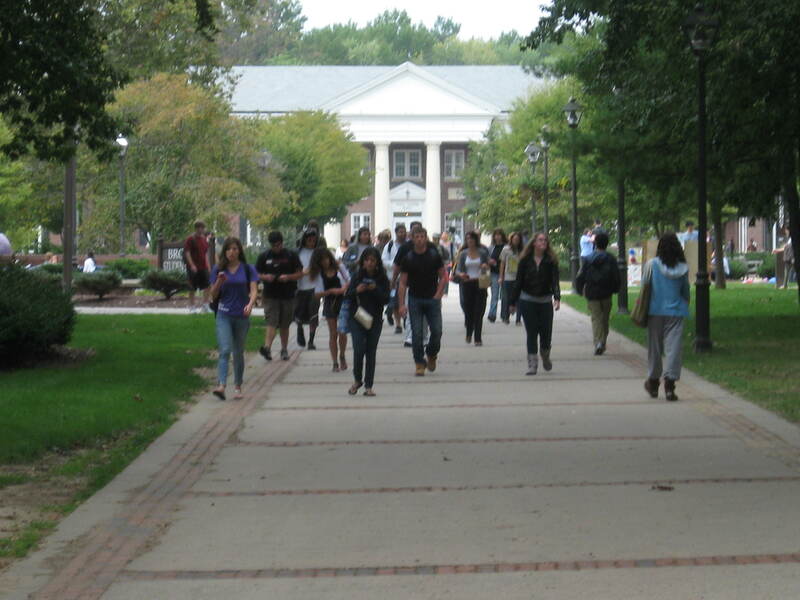 TCNJ is considered against many schools from Rutgers to the Ivies. Since TCNJ is so popular in my home state, I have an updated profile as well as photos to share. There’s a lot to like about TCNJ from the campus (most buildings follow a colonial style theme that makes the place look more like Bucknell) to the emphasis on undergraduate education. TCNJ offers few graduate programs, so the undergraduates get most of the attention, especially in most of the liberal arts, business, sciences and engineering. TCNJ is also the best public school in New Jersey to learn to become a teacher in an elementary, middle or secondary school. The housing options after freshman year are impressive, from suite-style halls to apartments, townhouses and small houses. The College has also built its own “downtown” called Campus Town to serve students and the community. I’ve had many a cup of coffee at the Barnes or the Panera on campus. If you visit TCNJ and like thin-crust pizza, you can build your own at the Piccola in Campus Town. Last year, The Princeton Review reported that TCNJ students are among the happiest in the country. The freshman retention rate (94 percent) and four-year graduation rate (72 percent) help back this up. Students are more likely to be happier at a school where they choose to stay instead of transfer out. I have read many editions of The Signal, the TCNJ student paper, since Campus Town opened last year. In general, the college administration appears to be responsive when it comes to resolvable issues from renaming buildings to funding student clubs, events and organizations. It has steadily managed renovations to virtually every campus building, though the freshman halls will be among the last to be updated, and worked with the state’s economic development community to fund Campus Town. TCNJ faces two major issues going forward: costs and connections. Tuition and fees exceed $16,000 for New Jersey residents, among the highest in-state charges in the country, while need-based and merit-based scholarships are limited. And, while career services keep improving, the College has a short history as TCNJ. Known as Trenton State College until 1996, it has primarily been a teacher’s college for most of its existence. However, the alumni who graduated in the early and middle Nineties are advancing into positions of seniority. They should be able to provide more resources to help their alma mater—and they will be extremely welcome in a state that has not recently been in the best of economic times. If I was a high school senior in New Jersey with the academic record that I had as a high school senior nearly 40 years ago, I would probably borrow a car from my parents to visit Rutgers and TCNJ, presuming I got into both schools. I would have had a very tough decision all the way to Deposit Day. Check out my update on The College of New Jersey! Check out my College of New Jersey Pinterest page! Need help in considering colleges or making a college list? Already in college, but considering a transfer? Contact me at stuart@educatedquest.com or call me at 609-406-0062.